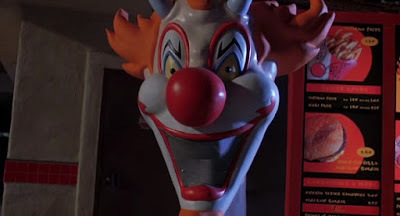 Horny The Clown, the demonic mascot of "Hella-Burger," starts slashing Orange County teenagers with his meat cleaver from Hell. This is a film that from the get go you know what you're in for, it's not going to test your political stance or your IQ, it may lower it actually so beware. If you're up for a laugh then this film is for you, as with many Slashers it's all about the deaths, the humour and the jump scares and there's plenty. I love the costume of 'Horny The Clown', he's got a killer mask (pun intended) and it deserves more recognition. Sure the acting is a bit amateurish but it's nothing to put you off. The script is actually a surprise as it's a well written story and has some intelligence to it, something that is totally unexpected for this style of film. 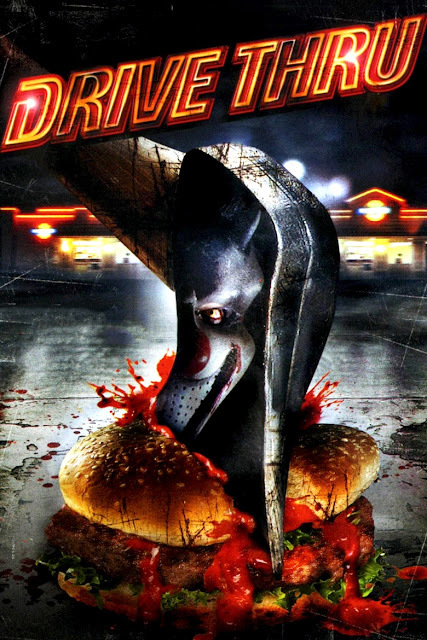 "Drive-Thru" is a fun flick, even if it is just for a one time watch. Morgan Spurlock, who plays Robbie, the manager of the fast food joint Hella Burger, was responsible for the anti-fast food documentary Super Size Me (2004). Leighton Meester's first feature film where she's first in the credits. The town is named Blanca Carne, which is Spanish for "white meat". Leighton Meester and Penn Badgley later worked together on Gossip Girl from 2007 to 2012.